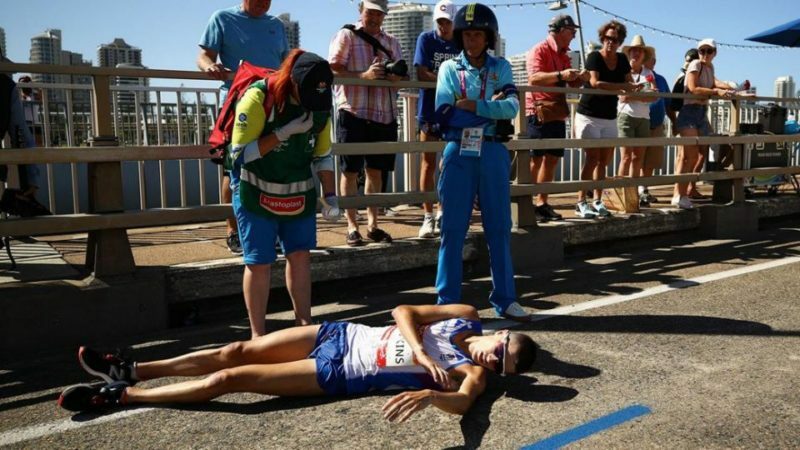 There was an astonishing scene on the final day of the 2018 Commonwealth Games in Australia as marathon leader [Callum Hawkins] broke down under the scorching sun [28 degrees] forcing him out of the race with few kilometres to go. The Scot collapsed in front of shocked spectators on the Sundale Bridge [40km into the marathon] and unable to go any further. There were lots of concerns with regards to the condition of the weather before the race got underway but thankfully the medical staff were able to revive Hawkins after a short delay and was taken to the hospital for further check up. “A lot of concern about the Scotsman Callum Hawkins,” Seven reporter – Pat Welsh shared an update on the unfortunate incident. Team Scotland later shared a positive update on Twitter, saying there were no major concerns. @Team_Scotland – CALLUM HAWKINS UPDATE:Callum has been taken to hospital for medical review following his collapse in the Marathon as is standard procedure. He is being supported by Team Scotland medical staff & there are no major concerns at this stage.More information to be issued in due course. A Namibian athlete – Reonard was the first to pull out of the marathon. Australia’s Michael Shelleyn won the gold medal with a time of 2hrs:16min:46 seconds. Munyo Mutai [Uganda] held the silver whiles Robbie Simpson won the bronze.